Cesar Chavez at a Coachella Rally, 1975 © Carlos Legerrette; from the archives of the Farmworker Movement Documentation Project. 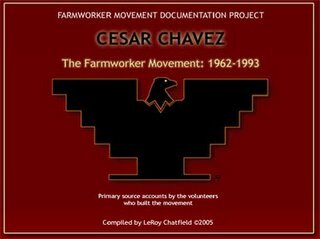 The LA Times is publishing an intentionally disturbing series on the heritage of Cesar Chavez and the union he founded, the United Farm Workers Union. The tenor of pieces is caught in the first headline: "The UFW betrays its legacy..." I believe this reporting is mostly true, in the sense of being factual. However, is the LA Times indictment of the United Farm Work Union fair? That, I am not so sure about. Here's my take on the series and the paradoxes it points to. The first article charges that the contemporary UFW represents very few farmworkers. Today the UFW seems more interested in promoting the deceased union founder's name and raising money through direct mail appeals than in organizing the people in the fields. The second explores the web of interlocking nonprofit enterprises run by Chavez' successors, mostly relatives. The third tells the story of the blow ups within the union in the mid-1970s after it had partially won a legal structure within which to unionize California agriculture. Chavez believed his leadership was being challenged by a series of organizers and farmworkers. Many who had devoted years to La Causa were forced out; the LAT reporter dates the decline of the union from these episodes. In the interest of full disclosure, I should say I worked for the UFW twice, briefly, first on the grape boycott in Boston in 1970-1971 and again in New York City in 1972. Later, when located in California, I reported on the UFW for various alternative and religious media through much of the 1970s and volunteered on the San Mateo County boycott. I was never anywhere near the center of the union/movement, just a peripheral staffer, supporter and observer. Yet the gist of what the LA Times reports rings true -- but not as the whole story. Here's how I see it: in the 1960s and 70s, Cesar Chavez' United Farm Workers Union was a stirring, seething locus of social creativity, bound together by its founder's charisma. It was a multi-headed beast, providing structure and meaning to very different tendencies and constituencies. Most obviously, it was a labor union, organizing to win better wages and working conditions for agricultural workers. True to Chavez's roots in community organizing, it engaged whole communities with the struggle of the farmworkers for justice, especially settled Latinos who had escaped the migrant labor stream and put down roots in rural California. It ran a network of social services, clinics, a credit union, a gas station and more. It pioneered a creative tactic, the grape boycott, that carried what could have been a local California struggle to cities across the country and world, engaging literally millions with the well-being of farmworkers. The farmworkers' movement served as a catalyst and rallying point for the struggle for Brown people's civil rights in whole Southwest. It was also a beacon for Latino and Chicano cultural nationalism as a formerly muzzled segment of the population articulated its identity. 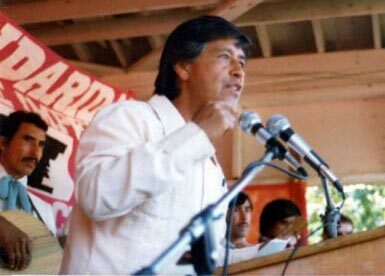 The UFW attracted a stream of earnest, mostly white, mostly middle class, progressive people who learned class consciousness and organizing skills from the farmworkers and went on to work in labor, politics and communities all over the country. The movement incorporated the workers' Roman Catholic spirituality, marching to victory behind the Virgin of Guadalupe. Chavez also urged a philosophy of self-sacrificial non-violence, drawing on many traditions including those of Gandhi and Jesus. And I'm sure that other veterans of the movement could and would suggest more things the UFW was to its many adherents. Nobody straddled all these tendencies but Cesar Chavez himself. Not surprisingly, as the movement grew, tensions between devoted workers who emphasized different parts of this complex package within the movement only increased. I wasn't around for "the purges" of the late 1970s (some described in the third LA Times article) but the centrifugal forces in the movement were obvious well before that era. As the UFW both grew more powerful and met ever more ferocious, organized resistance from the corporate agriculture, it is not at all surprising to me that it could not contain all its potentialities. As early as the spring of 1973, I saw workers picketing their own union headquarters in Coachella to protest arrogant local leadership. And I certainly saw for many years a UFW culture that treated speaking about any of the strains within this extraordinary movement as a form of treason. Over the last few years, Leroy Chatfield, one of the early pillars of the organization, has re-contacted over 1000 of the people who worked for the UFW between 1962 and 1993. He solicited reminiscences, collected songs and pictures, and began an email discussion list -- all to capture for history some of the knowledge and passion among these veterans. Much of this material is available on the web at the Farmworker Movement Documentation Project. Chatfield won wide participation by scrupulous refusal to tamper with any voices: "All primary source accounts have been included, and none... have been edited for content, length, voice, or tone." Unfortunately this unedited inclusivity makes the collection is a bit hard to navigate; it simply presents all the collected essays in a rough chronological form, leaving it to the interested browser to sort through its remarkable riches. For many participants, the Documentation project provided a stimulus to mull over the issues raised by the LA Times articles: what was the UFW? Why was it so important in the lives of so many? Did it succeed or fail? What was its core? Why are farmworkers still unorganized and vulnerable to exploitation? The stories and answers are many; I haven't begun to read them all but anyone interested in going deeper can find much here. Of course, from the first meeting, I was tremendously impressed with Cesar and I remained tremendously impressed until the day he died. ... [T]here were people who felt I was so taken with Cesar and the struggle that I felt he could do no wrong. They were right. Certain doubts came later. Cesar Chavez was a great man. He was a human being and therefore not perfect, but he was a great man. The only one I ever met. I have recently...wondered why I felt so strongly, so clearly, that Cesar was a great man. There were two reasons. First, his complete commitment. We all know that the struggle was his whole life. Everything. In the years following my full-time employment by the farmworkers’ union, I came to know the leaders of a number of low-income groups. Several of them had Saul Alinsky connections. ... None of them came close to Cesar in terms of commitment or overall stature. The other truly outstanding characteristic of Cesar was his absolute incorruptibility. Many--not all--of these guys were easily bought off by money, status, or any of the other temptations we all experience. Not Cesar. Probably inevitably, Chavez' multifaceted movement didn't last, but the ripples he set off are still running outward from his work. UPDATE: The final part of the LA Times series appeared today. It is not really about the UFW. Rather, it celebrates the story and hopes of Eliseo Medina who, coming from a background in the UFW, oversees Service Employees International Union operations in 17 states in the South and Southwest. The reporter clearly believes that Medina represents a new kind of leader for new times, one who can organize a movement as vibrant and creative as the UFW was thirty years ago. Low-wage workers certainly need such a movement just as much today as in Delano in 1962.